Just as a cricket team cannot be expected to win playing with just seven players instead of eleven, the Indian Air Force (IAF) cannot be expected to do its job with fewer warjets than it needs. Following gradual decommissioning of obsolete aircraft over time and the loss of aircraft in crashes on the one hand, and massive delays in purchases of new aircraft on the other, the IAF is now left with only 30 fighter squadrons — and in a couple of years, it will be down to 26 squadrons. 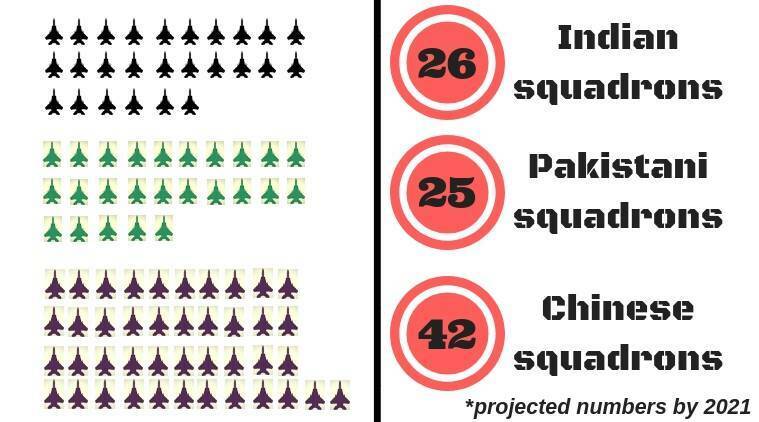 In comparison, the Pakistan Air Force will have 25 squadrons of fighter aircraft, while China will be able to unleash as many as 42 squadrons upon India in case of a conflict. The government’s mandate for the IAF is to be prepared for a two-front collusive threat from China and Pakistan. For this, the force is authorised 42 squadrons of fighter aircraft, which is the bare minimum it needs to dominate a two-front conflict. But the last time the IAF had the full complement of 42 squadrons was nearly 17 years ago, and the numbers have only fallen since. The indigenously developed and produced LCA Tejas has to provide the bulk of the numbers — IAF is committed to get six squadrons from HAL, four of them of the Tejas Mk1A version. While HAL hopes to provide 18 aircraft per year, it has not been able to ramp up capacity to even half that number so far. This situation can impinge on the availability of fighter squadrons in the near future. The other option is to import more fighter aircraft. IAF will get two squadrons of Rafale by 2023, and it has plans for six squadrons of another foreign fighter within a decade. But the latter is still a proposal on the planning board, and a long way away from seeing the light of day. The IAF is looking at a scenario where it will have to undertake emergency imports — perhaps at an exorbitant cost — to make up the numbers. How Do Other Major Powers Tackle Situations Like These? Among the global military powers, India is perhaps the only country which doesn’t produce top quality fighter jets indigenously. The US, Russia, and the European powers, all have highly developed defence industries that can design, develop, produce, and supply fighter jets to their air forces. Countries like Pakistan and Israel can depend upon their allies — Pakistan Air Force earlier got F-16s from the US and now it gets the JF17 from China. India has no such option. The long-term answer is to promote indigenous manufacturing in a major way, but in the immediate term, there is a need to take steps to ensure that this shortfall is made up quickly. That is a national security imperative.